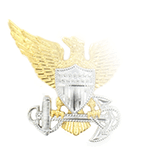 The Engineering Duty Officer (EDO) insignia, along with its design and wear guidance, was first announced in NAVADMIN 310/17 dated 17 December 2017. 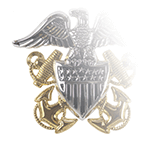 Awarded to Restricted Line Officers with the 144X designator who complete the EDO Qualification Program, the insignia consists of a pair of oak leaf branches bookending a silver circle containing a three-bladed propeller (one blade vertical) centered atop a gold, fouled anchor. Behind the circle and propeller are two crossed Navy Officer swords. 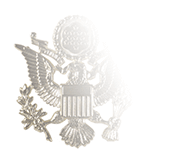 Normal size EDO insignia are authorized for wear on all uniforms except the Dinner Dress, while the miniature version is worn with mini-medals on the Dinner Dress uniforms. 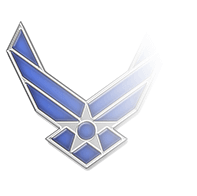 Officers who have earned a warfare qualification badge along with the EDO insignia will wear the latter in the secondary position; EDOs who have earned two or more warfare qualifications will not the wear the EDO insignia. The first officers to be pinned with the EDO insignias were members of Space and Naval Warfare Systems Command and Naval System Command. 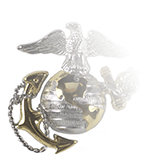 They received their new insignias at a ceremony held at the Washington Navy Yard on 8 January 2018.